I have an interesting little Champ today that kicked off an interesting line of thought for me. It is tweed Fender Champ C-04270. Dating this amp by its serial number tells us it was made in about mid-1957. For a more specific date of manufacture we need to look at the stamped two letter tube chart code. The photo I have is quite blurry but the owner tells me that the two letter code is GE which translates into May 1957. Since we don’t have a real clear photo of the tube chart, I’m going to assume that what the owner has told me is correct and that this is a 5F1 Tweed Champ. The one item that catches my attention about this is the missing serial number that should be under the fuse cap on the top of the chrome chassis. On the 5E1 Champs, the serial number was stamped into the underside of the chassis between the tubes – like this. 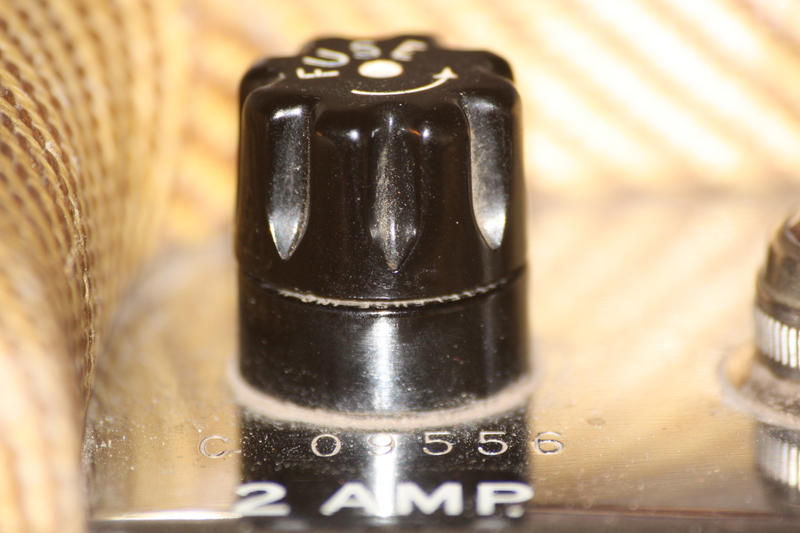 I had thought that when the Champ was revised and became the 5F1 (roughly the beginning of 1956), the serial number moved to the top of the chassis, right under the fuse cap – like this. A little homework tells me that this isn’t entirely true. C-04268 shows this same lack of serial number on the top of the chassis (and I have a crystal clear shot of its tube chart) and so do C-01232, C-02499, C-02678, C-03084, C-03143, C-03323, and C-04268. All of these have clear enough pictures of their tube charts to indicate that they are all 5F1s. Since this a relatively large spread of serial numbers, I think it is safe to assume that there were quite a few early 5F1s with the serial number stamped on the underside and Fender moved the serial number to the top at some point well into the life of the 5F1, not right at the transition like I had originally thought. So, we can deduce a couple of things. First, we know that the Champ transitioned from the 5E1 model sometime after C-00789 was made in December 1955 and before C-01232 was made in January 1956. If anyone has a Champ with a serial number in between these two, please let me know. I’d be most interested in seeing the serial number and tube chart combination to try and pin down at what point the transition between 5E1 and 5F1 actually occurred. Next, we now know that a good number of 5F1 Champs made in 1956 had their serial number stamped on the underside of the chassis in the 5E1 style. The latest example I have of a 5F1 Champ with the underside serial number is C-04270, the amp in this post. The earliest example I have of a 5F1 Champ with the serial number on top is C-07927 made in September of 1958. That is a big gap between May 1957 when C-04270 was made and September 1958 when C-07927 was made. It is logical to assume that some where in there is a sweet spot transition from the underside serial number to the top side serial number. If anyone has examples of 5F1 Champs in between C-04270 and C-07927, I’d love to hear about where their serial numbers are positioned and try to pin point when the shift from underside serial numbers to top side serial numbers occurred. I’m not sure why it would be necessary to reposition the serial number. My best guess is that it aided with inventory. Reading a serial number on the top is much easier than having to turn the amp upside down. Hope you enjoyed this post, and please let me know if you have Champs that fall into the categories above. If your tweed Champ doesn’t fit the bill, drop me a note anyway, I’d be happy to write up a post about it. Don’t be afraid to email me! If my logic is flawed, don’t hesitate to call it out in the comments. One last thing I almost forgot. I’m pretty sure that that short tweed case next to the Champ amp in the featured photo is a Champ lap steel. Prior to the Telecaster and Stratocaster changing the world of electric guitar forever, the lap steel was the hottest thing around. I have Champ (GD) C-04317 and SN# is stamped on the underside chassis.